Big news — Elizabeth will be speaking at the Democratic National Convention on Wednesday night with President Bill Clinton. She was asked to speak because President Obama knows that Elizabeth is one of the strongest advocates for what’s at stake for the middle class — and our shared vision to move the country forward. 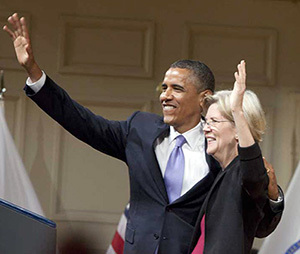 Sign on now and say: I stand with Elizabeth Warren and President Obama when it comes to fighting for the middle class. This is big, big, big — and it means yet again we need to step up our game. The Republicans no doubt will be coming after us hard — not only as we fight for working families here in Massachusetts, but also as we take the case to the country about what’s at stake between President Obama and Mitt Romney. We need to give Elizabeth all the support she needs as she plays this pivotal role at the convention. Take the first step — tell Elizabeth and President Obama that you have their backs.